Joan and I have just returned from a two week trip to Central Europe, visiting the major cities of Prague in the Czech Republic, Bratislava in Slovakia, and Budapest, Hungary. It was an amazing, eye-opening, life-changing experience. We learned more about that part of the world in two weeks than we had accumulated in all our years prior to. I am always humbled to realize how much I don’t know in spite of my above average education at the Ohio State University, the University of Cincinnati, Monmouth College, Hammond High School, and the school of life. I believe it was Will Rogers who once made the point that we are all ignorant, but just about different things. For example, I understand photophosphorolation in the process of photosynthesis, but very little about the renowned writer, Franz Kafka, whose home was in Prague. This trip provided me with even greater insight into the message I wanted to share this morning, what I believe is an important perspective on Unitarian Universalism. For those of you who are not fully acquainted with our faith community, it might serve as a primer of what we are all about. For those of you who have been around much longer than I have, it might provide a basis for discussion and thought. As a beginning point, let me share a brief look at my personal journey that has elements common to many people in the congregation this morning. I am a refugee from the Presbyterian Church in the USA and Calvinism in general. I was Baptized in the Presbyterian Church, was, along with Joan, a Junior High Advisor, taught Sunday School, was a member of the Presbyterian Men’s Association, and was ordained as a ruling elder in the church. I was totally immersed. There were things that I had questions about along the way but I just accepted what I was being told on faith. I looked about those congregations and saw lots of people smarter than I who bought into that faith tradition. But there came a point where it just didn’t make sense to me. There finally came a time when I could no longer be comfortable in that environment. Surely if I were a child of God, I could not also be the miserable, undeserving creature that the preacher was telling me and the rest of the congregation that we were, saved only by the grace of God. I dropped out, it was just more than I could accept. For many years I had no church home at all. Almost ten years ago, I discovered Unitarian Universalism almost by accident. Wanting spiritual growth and a sense of community, Joan suggested that we attend a service at the old church location at 1818 31-W By Pass. In spite of my misgivings about checking in on some kind of cult, we went one Sunday, and the rest is history. I chose this Church, this is MY CHOSEN FAITH, my Beloved Community, and I want to talk about it. Some of what I have to say today comes from a sermon given by the President of the UUA, the Rev. Peter Morales, a copy of which was sent to me and others by Jan Garrett, our philosopher in residence. I met Peter Morales in Salt Lake City at the General Assembly in which Joan and I participated. Peter is a likeable man, one with a vision for what Unitarian Universalism can be. He was running for President at the GA and gave out free T Shirts, so of course I voted for him. To be sure, the message he gave during the campaign excited me. I thought of him as the kind of leader I could follow. It is true, he did land in jail back in August for an act of civil disobedience, protesting the immigration legislation passed by the Arizona legislature. But he is a free man now. His sermon touched me deeply and strengthened my faith in UUism. It helped me put into words, what I already felt, about what it means to be a Unitarian Universalist, what it is all about. Interestingly enough, Todd Eklof made some of these points in his presentation last month. But, in all forms of advertising, repetition is the key to getting a message across. Ten years ago, I knew nothing about Unitarian Universalism. It was completely off my religious screen. So I can appreciate how those not acquainted with our church might be puzzled as to who we are, perhaps hesitant to drop in and check us out. We are a small denomination, just a blip on the theological spectrum. Many do not take us seriously, or have all the wrong ideas about us. Well, it doesn’t get much better than this. Sometimes I wonder how it is best to describe our faith to others. In our Beloved Community, we do not have a set of rules to follow, dogma or creeds to sign on to. We are a bonded community on the basis of what we do, the lives we live, and what we love. When the Rev. William Sinkford was the President of the UUA, he asked us to prepare an elevator speech, so that if someone were to ask us on the 10th floor what UUism is all about, we could give a succinct description of our faith by the time we reached the first floor. I always found that a bit difficult, I have a tendency to ramble. So when I read this beautiful articulation of our faith, I said to myself, yeah, that is the way I see it, that is the way I feel. “When we focus on what we truly love, we ask life’s essential questions. We ask questions like, “How shall I live?” When we ask the question together in community, it becomes, “How shall we live together? What shall we do together?” When we focus on what we truly love, we discover something wonderful: we discover that we love the same things.We realize that we need one another. We want to be compassionate and gentle with one another. We want to raise children who are kind, content and responsible. We aspire to create a religious community where we can come to know one another more deeply. We want to create a place where we can cry together, laugh together, sing together, learn together, and act together. We want a place where we can come together to remind ourselves of what is truly worthwhile. That is what worship is—it is literally an affirmation of worth. These affirmations are in sharp contrast to what I was expected to believe in my former life. Each Sunday morning I along with the other members of the congregation repeated in unison the apostles creed as our statement of faith. What does this creed affirm about Jesus’ life and teachings? Not one thing. It states merely that he was born in an unusual way and died in an unusual way, telling us nothing about the fact that Jesus lived in an unusual way. This is what is important about Jesus. Not that he existed before he was born; was implanted in a virgin’s womb; visited hell after he died; and then returned to be resurrected and reign in heaven. These are dogmatic propositions of faith. They can be confirmed in faith alone, and a mighty leap of faith at that, for they stand in direct contradiction to nature’s laws. Please don’t misunderstand me. I am saying that Jim Martin no longer accepts that statement of faith and belief as his own. But what Jim Martin believes or doesn’t believe is not that important, I realize that there are 2 billion or more people in the world who do accept those as the tenets of their faith, and for many it brings comfort, peace, understanding, etc. From the earliest of times humans have found it necessary to create gods and religions to help them explain the unknown. Joan and I deliver meals on wheels to seniors around town who are confined to their homes. One of our clients, who I have come to enjoy visiting, is a little, 80-year-old, black lady named Pearline. She is so crippled with arthritis she is always in a wheel chair when I drop in. She lives alone and sometimes confides in me that she does get lonely, but she is the most positive person I encounter on our rounds. When I knock on her front door there is a bumper sticker that says JESUS, when I go through the dining room, there is the picture of Jesus seated at the table for the last supper, as I look about the house there are Bible quotes everywhere. Pearline’s faith sustains her, and I respect that. Unitarian Universalists draw our strength from many of the major religions of the world. We are not here to put down other faiths, but rather to enrich our lives within this one. Yet I want to make a more radical point. The point is that religious belief is actually the enemy of religion. Every major religious tradition seeks to impart a sense of wonder, mystery, awe and humility. Belief systems stop this cold. Belief systems start where our thinking stops. Once we think we have explained it all, once we think we have all the answers, our minds close and we become arrogant, belligerent and defensive. Just look at what happens when a belief system takes hold. What follows is truly horrible. First, we categorize everyone who does not agree with us as either ignorant or evil. If we have the truth and are certain we have it, then our task in life becomes spreading this truth. Our task also becomes defending the truth from all of those who disagree. Believers have enemies everywhere. The world becomes a battleground. This is the world of Muslim fundamentalists blowing up innocent people and of Christian fundamentalists trying to criminalize gays and lesbians. This is the world of John Calvin burning Michael Servetus alive because Servetus did not agree with the doctrine of the trinity. This is the world of the Spanish Inquisition. Once a religion becomes an all encompassing belief system, murder will surely follow. Believers are dangerous. They always have been. My recent trip to Central Europe brought this point home once again. It is obvious how the power of the Holy Roman Empire established what amounts to a state religion. Some of the most impressive buildings we see are cathedrals. In the same cities there are generally Jewish Quarters of ghettos for contrast. Jews do not accept the Christian dogma and creeds, therefore they are not fit to live with normal people. One experience in Prague hit me pretty hard. We visited a synagogue that has become a memorial to the tens of thousands of Jews who were taken off to concentration camps to be exterminated. I wore a small yamuka as requested for the visit, now a treasured souvenir for me. In moving testimony to this human tragedy, the survivors had printed on the white walls of the sanctuary the names of eighty thousand individuals from that ghetto who were lost. Much like our Vietnam Veterans memorial in Washington, DC., this brought home the point that these were not the faceless masses, but individuals who had families, dreams, hopes like other people in Prague, but who did not have the same beliefs as members of the dominant Christian community. The enormity of the Nazi final solution may overwhelm us, but also remember that the holocaust victims were living in a ghetto. Their Christian neighbors did not want them mingling with people of the proper belief. Then it often comes home to this recovering Presbyterian, that the founder of my former church, John Calvin, had Servetus burned at the stake because he would not accept the doctrine of the trinity. A personal note. While in Prague, Joan and I found the Unitarian church in town. It was once the largest Unitarian congregation in the world with a fellowship of some 2000 people. Because of scheduling conflicts we were not able to attend a service. Nazism and Communism changed the religious climate during their stay in Prague. Now the Czech Republic is 60% atheist. Even the Unitarians suffered. So, if religion isn’t really about what we believe, then what is it about? Can we be religious without a belief system? I am convinced that religion without belief is true religion. Religion that is focused on belief is a dangerous corruption of true religion. Religion without belief is not phony religion. It isn’t fake religion or pretend religion or partial religion or religion lite. I have heard critics of liberal religion complain that ours is church where people can believe anything they want. Actually, that is not true. I cannot truly believe anything I want. I would love to believe that I will live to be 900 years old and will play professional baseball. What is important about liberal religion is that you and I don’t have to pretend to believe what we don’t believe. We don’t have to lie. But most importantly, we don’t get caught up in endless ridiculous debates about whose beliefs are correct.People, millions of them, seek a religious community where they can nurture relationships, raise children, deepen spiritually, and serve a mission that is worthy of their highest ideals. What these millions are seeking is a religion beyond belief. We can be that religion. We can feed the starving multitudes. The words of Peter Morales are words of inspiration and clarity. They help us focus on what we are as UUs and what we can become. Some of us are feeding the multitudes, one mouth at a time. Our minister has led us to respond to the needs of our community as a congregation. Others are expressing their concerns and love for our community in various ways.We gather in small groups to come to know one another better, that is part of the tradition of this congregation. I know more about the people in this congregation than any other group I have ever been a part of. We are eager to learn more about the world in which we live, to explore the words and deeds of great men and women. So as individuals and as a Beloved Community we have a beginning. We welcome into our community all who are of a like mind, who love the things we love, who are ready to act to heal a broken world, who wish to share the fellowship you see about you. No this is not an alter call, this is just an invitation to learn more. 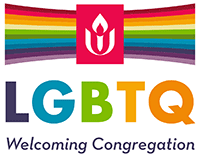 On Saturday morning, Oct. 9 we have a program we call “Getting to Know UU.” In a non-threatening environment we give you a more thorough background for the Unitarian Universalist faith and the activities of this congregation. If you might be interested, see me after the service or sign up on the sheet on the bulletin board. UUs are neither chosen people nor a people whose choices are made for them by theological authorities, ancient or otherwise. We are a people who choose. Ours is a faith whose authority is grounded in contemporary experience, not ancient revelation. Though we find ourselves naturally drawn to the teachings of our adopted religious forebears, these teachings echo with new insights, insights of our own. Ralph Waldo Emerson did not seek disciples; he sought people who could use their minds and tap their souls as profoundly as he did. In a UU Church, revelation is an ongoing process; each of us is a potential harbinger of meaning.